Fierce competition has forced firms to be more creative and innovative to increase market share. Differentiating between green products or services with conventional products or services is one of the ways for firms to improve their business sustainability. 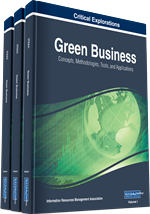 The objective of this chapter is to explore the eco-innovation enablers and design its typology to measure the current green business practices in industry. Although there are many well-documented enablers or practices of eco-innovation that have been researched, this chapter focuses on practices that contribute towards the successful adoption of eco-innovation by one SME in green furniture manufacturing. This chapter uses the case study method as a source of data collection. Eco-innovation typology has been found in this study to define the effort of green company by looking at the target of eco-innovation versus the mechanism of eco-innovation. In extant management literature, innovation is perceived as a relatively new concept (Türker, 2012). However, innovation is no longer a new concept and phenomenon to popular belief. Türker (2012) argued that innovation is as old as humankind itself. According to Fagerberg, Mowery, and Nelson (2006), innovation seems to be something integrally “human” about the tendency to deliberate about better ways of doing things and practice in reality. This deep-rooted and well-established concept had been worked by scientists during the history of the social sciences. According to Schumpeter (1934), innovation is defined as “to produce means to combine materials and forces within our reach. To produce other things, or the same things by a different method, means to combine these materials and forces differently”. To explain the statement above, Schumpeter (1934) used the concept named “new combinations” for his explanation. It is a strong connection between the definition of innovation that commonly being adopted today and Schumpeter’s “new combinations”. The “new combinations” can be any new product with which customers are not familiar; a new technique of production that not yet being practised in the branch of manufacture concerned; a new supply source of raw materials and resources; a new target marketplace; or a new organization of any industry (Schumpeter, 1934). Therefore, “new goods” do not fully reflect the meaning of innovation.